Falling bombs raised smoke over Islamic State’s last enclave in east Syria, obscuring the huddle of vehicles and makeshift shelters to which the group’s self-declared “caliphate” has been reduced. Air strikes and artillery began hitting the area and smoke billowed overhead as US-backed forces resumed a weeks-long attack, a Reuters reporter said. After dark, a Kurdish TV channel broadcast footage showing fires raging and the glow of rockets pounding into the enclave accompanied by intense gunfire. During an earlier lull in fighting, tiny figures of people still inside were visible among hundreds of trucks, cars and minibuses clustered around concrete buildings on the bank of the Euphrates. It is all that remains to Islamic State in the heartland of the territory it seized in 2014, taking advantage of chaos in Iraq and Syria to grab about a third of both countries and eradicate the border. Group leader Abu Bakr al-Baghdadi is still at large and regional officials believe it will remain a threat after it has lost all its land. The enclave is Baghouz, a handful of hamlets in farmland next to the river along the Iraqi border. Despite its size, more than 60,000 people fled it in the past two months, said the besieging Syrian Democratic Forces (SDF) militia. Nearly half were surrendering Islamic State supporters, mostly family of jihadist fighters with 5,000 armed militants giving themselves up, SDF spokesman Kino Gabriel said. Another 34,000 civilians were evacuated. Former residents say many civilians who left the Baghouz area in recent weeks were Iraqi Sunnis with tribal ties over the border in Deir al-Zor, a Sunni heartland. They sought sanctuary in Syria for fear of reprisals by the Iraqi Hashd al Shaabi, the Iranian-backed Shi’ite militias in Iraq, the former residents said. 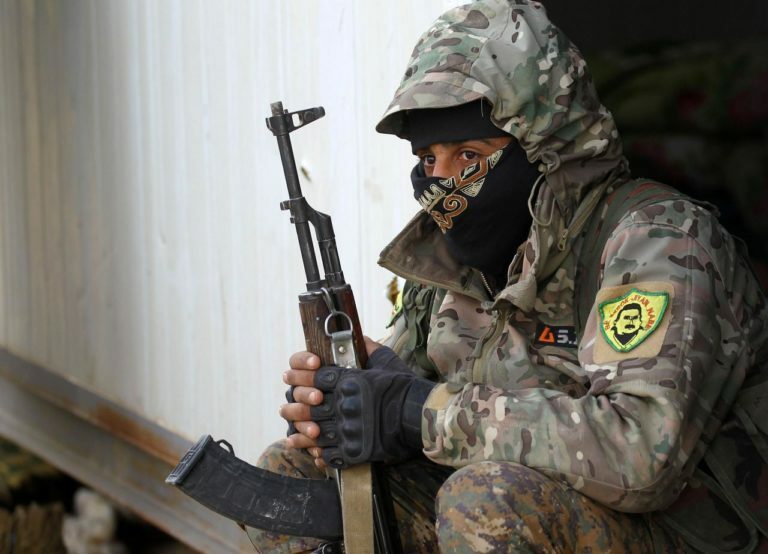 Another SDF spokesman, Mustafa Bali, told Reuters about 100 militants and their families surrendered overnight where hardline insurgents mounted a desperate last-stand defence. “We expected the surrender of a large number of terrorists and their families but only a small group came out,” Bali said. On Friday suicide blasts targeted some people leaving Baghouz and surrendering to the SDF. The SDF said 1,306 “terrorists” were killed alongside many who were injured in the military campaign that began on January 9, while 82 SDF fighters were killed and 61 injured. The SDF said another 520 militants were captured in special operations in the last Islamic State bastion. Former residents say hundreds of civilians were killed in months of heavy aerial bombing by the coalition that razed many hamlets in the area. The coalition says it take care to avoid killing civilians and investigates reports that it has done so. The SDF transferred the thousands who fled Islamic State’s shrinking territory in recent months to a camp at al-Hol in the north-east. A senior International Committee of the Red Cross (ICRC) official said an estimated 20,000 Iraqi women and children in the camp were expected to be sent home within weeks or months. The United Nations said the camp holds around 67,000 people, 90% of them women and children – well beyond capacity. Camp workers do not have enough tents, food or medicine.